"Placed at a critical time and the cusp of being human, Australopithecus afarensis was more derived than Ardipithecus (a facultative biped) but not yet an obligate strider like Homo erectus. The Dikika foot adds to the wealth of knowledge on the mosaic nature of hominin skeletal evolution" explained Alemseged. 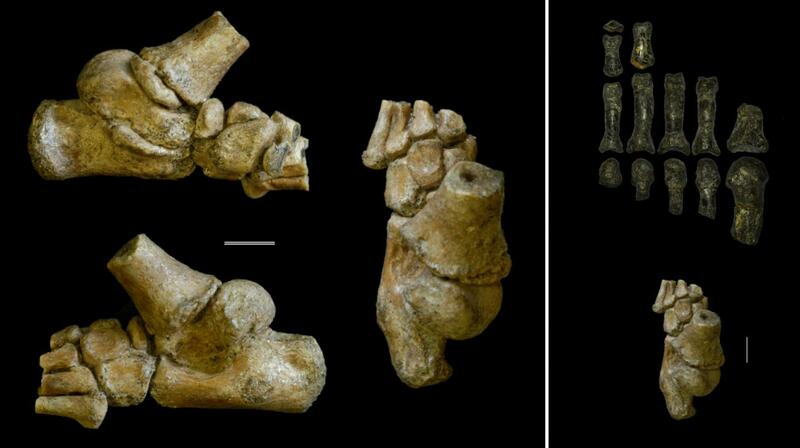 Given that the fossil of the tiny foot is the same species as the famous Lucy fossil and was found in the same vicinity, it is not surprising that the Dikika child was erroneously labeled "Lucy's baby" by the popular press, though this youngster lived more than 200,000 years before Lucy. In studying the fossil foot's remarkably preserved anatomy, the research team strived to reconstruct what life would have been like years ago for this toddler and how our ancestors survived. They examined what the foot would have been used for, how it developed and what it tells us about human evolution. The fossil record indicates that these ancient ancestors were quite good at walking on two legs. "Walking on two legs is a hallmark of being human. But, walking poorly in a landscape full of predators is a recipe for extinction," explained DeSilva. At 2½ years old, the Dikika child was already walking on two legs, but there are hints in the fossil foot that she was still spending time in the trees, hanging on to her mother as she foraged for food. Based on the skeletal structure of the child's foot, specifically, the base of the big toe, the kids probably spent more time in the trees than adults. "If you were living in Africa 3 million years ago without fire, without structures, and without any means of defense, you'd better be able get up in a tree when the sun goes down," added DeSilva. "These findings are critical for understanding the dietary and ecological adaptation of these species and are consistent with our previous research on other parts of the skeleton especially, the shoulder blade," Alemseged noted. DeSilva is available for comment at: [email protected] In addition to DeSilva and Alemseged, Corey M. Gill at Mt. Sinai School of Medicine, Thomas C. Prang at New York University, and Miriam A. Bredella at Massachusetts General Hospital and Harvard Medical School, also served as co-authors of the study.